This week, Toni gave us a really fun challenge. It was to design a 'non typical' size card. I am SO guilty of sticking to the normal size cards, so I was very excited to make this one!! I folded a piece of card stock in half, placed a Spellbinders die on the fold and ran it through my Sizzix. This gave me such a cute mini card. Then I simply took the next size down of the same die and cute out this adorable image from Digi Shack. 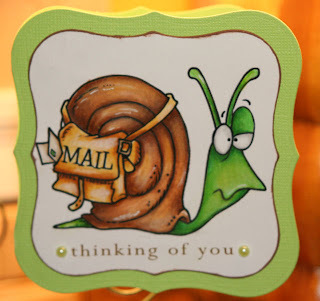 Snail Mail...LOL....boy isn't that the truth in this day and age of technology!!! When you get a chance, head on over to the Digi Shack and take a peak at the wonderful images Toni has to offer!!! Oh my gosh, Christina - this is ADORABLE!!! Stinkin' cute! Love your take on the challenge, you crafty little monkey, you! Christina, your card is fabulous! I love your coloring and your shaped card. Awesome job as always. TFS! Super cute card! We both thought to use Spellbinders...how great minds think alike ! LOL! What an awesome card, Christina!!! Great coloring!! I just love this card and the coloring is awesome!! So cute!! dude... I just LOVE him!!! Love the shape, coloring is impeckable! I wanna be u when I grow up! HOLY COW!! That snail looks real. LOVE IT..then again I love all your stuff. OMG!! I love this! Great job, supurb coloring, bright colors. WOW! You rocked this one girl!! LOL. What a funny card. How fun- love the non-traditional shape too! This is so adorable - what a creative fold, and your coloring is beautiful!